Have you ever made a dish that smelled great but, when you sink your teeth into it, left you thinking it could be more exciting? Maybe all that’s needed are a few simple techniques to layer on the flavor. One of the key reasons Dizzy Pig seasonings stand out over the rest is that the flavors hit you on many different levels. In other words, when the spices land on your tongue, the initial sensation and flavor is followed by new flavors that are detected at different times. Everyone tastes buds are different, but often a sweetness and hint of salt come first, followed by citrusy or herby notes and other undertones, then the heat and finally the garlic or onion flavors which often show 10, or even 20 seconds after the first taste. We call that depth of flavor, and it’s an important part of making exciting food. So simply using Dizzy Pig seasonings gives your food a deeper more complex flavor, but the flavor of the final product, when you take that long anticipated bite, depends on so much more. The flavor from browning food. When food is browned hundreds of brand new flavor compounds are produced. The browning of the spices and the browning of the meat both affect the final flavor, and add a new layer to your taste experience. 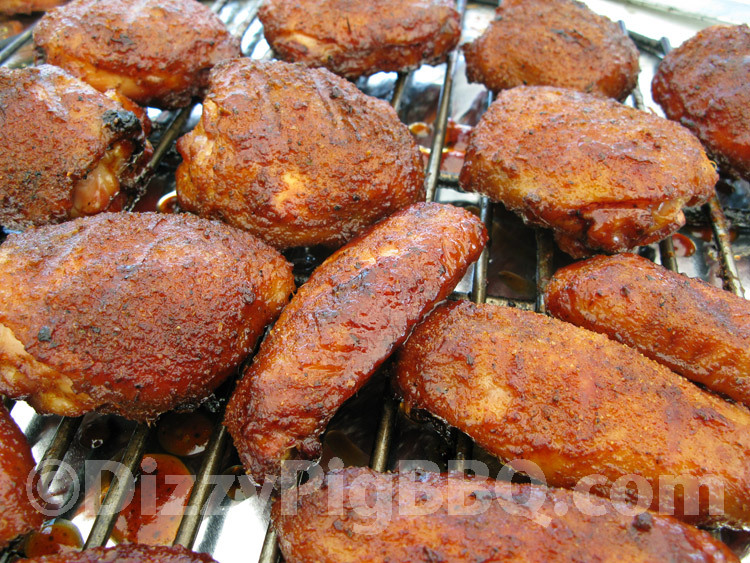 The smoke from your charcoal and/or wood imparts flavor. Sometimes good, sometimes bad, the flavor of the smoke is a key player that needs to be carefully controlled. The smoke flavor changes throughout the cook… it’s stronger early, and mild and peppery later in the cook. You may have heard it said that the meat only absorbs smoke for so long, but we’ve noticed that the smoke flavor is being laid down on your food the entire time. The milder peppery smoke gets laid down later in the cook, but the stronger early smoke will still be there… and this contributes to your layering of flavors. The smoke produced by the fat dripping on the coals. When fat drips on the charcoal it burns and produces a totally different kind of smoke than your wood or charcoal. When cooking direct, this smoke shows up later in the cook once the fat renders out of the meat. This smoke is one of the first things you taste on the final product. The flavor of the meat itself. Meat has a mild flavor itself, and when cooked that flavor is enhanced. Flavors deep in the meat from brines or injections. Brines and injections can add a tang, a sweetness, a saltiness that adds to your layering of flavors. Since the inside of the food is the last thing that hits your tongue, these flavors come later in the bite. Successfully layering your flavors will take some practice. The first step is to start thinking about flavors next time you bite into food that you cooked. Pay attention to what you taste first, how the other flavors follow behind, what you are left with after everything comes together as well as the after taste. Pay attention to the balance of flavors as well. Any flavor that is too strong will reduce your depth of flavor. Inject a marinade, and get some flavor deep into the meat. Brine. Adds a “zing” to deep inside the meat, and different flavors can be used. Hit your food with fresh seasoning toward the end to add a new layer. Caramelize your sauce at the end of your cook. Steaming or braising . . . or wrapping in foil. This tends to meld flavors together and tends to make all one flavor without layers. Yet it is possible to add layers of flavor AFTER you steam or braise. Over-smoking. Too much smoke and you have covered up the other flavors. Over-saucing or oil . . . anything that coats your tongue and close off your taste buds. Hopefully this info will help in your quest to produce the ultimate bite of food, or at least start you on a path to paying more attention to what is happening on your tongue! Happy cookin! !